The Canadian Opera Company’s new production of Dialogues des Carmélites is a magnificent achievement. Under director Robert Carsen one beautifully imagined scene follows the other and the fine singers act with the same attention to detail and nuance of the best spoken theatre. With a Canadian director, a Canadian set designer and a large cast who, save one, is entirely Canadian, Dialogues des Carmélites is also a celebration of Canadian talent. Simply to see Isabel Bayrakdarian, Judith Forst and Adrianne Pieczonka all in the same opera makes this an occasion not to miss. Dialogues des Carmélites (1957), the only full-length opera by French composer Francis Poulenc (1899-1963), is based on a play, in turn based on a novella concerning a real event that occurred during the Reign of Terror in France. The French Revolution was not only a revolt against aristocratic rule but also against the dominance of the Catholic Church which was at the time the largest landowner in the country. The Revolutionaries sought to dechristianize France and confiscate all Church property. Sixteen members of the Carmelite order of Compiègne resisted the suppression of their monastery and were arrested and tried as traitors and taken to Paris where they were sent to the guillotine on July 17, 1794, two weeks before the Revolution’s leader Robespierre was himself executed, ending the Reign of Terror ended. What was noted at the time, and is so heart-wrenchingly portrayed in the opera, was the dignified way in which the Carmelites met their deaths. They sang the hymn Veni Creator Spiritus and continued singing as one by one they mounted the scaffold to die. The opera begins on the eve of the Revolution in 1789 and focusses on Blanche de la Force (Bayrakdarian), a pious, timid noblewoman, who, contrary to the hopes of her father (Jean-François Lapointe), decides to join the Carmelite monastery of Compiègne to find peace within herself that she can’t find in the outside world. There she meets the happy, outgoing Soeur Constance (Hélène Guilmette), her complete opposite, who becomes her closest friend. The worst event of Blanche’s early time at the convent is witnessing the death of the Mother Superior (Judith Forst), who dies in agony railing against God. By Act 2, the Revolution has progressed and Blanche’s brother (Frédéric Antoun) warns her that the monastery is no longer a safe place, but she refuses to leave. When the police announce that the Legislative Assembly has confiscated the monastery and its property and that the nuns are no longer allowed to wear religious clothing, Mother Marie (Irina Mishura) convinces the nuns to take a vow of martyrdom. Blanche takes the vow but runs away to her father’s home. When the nuns are arrested and sentenced the question is whether she will fulfill her vow or not. Michael Levine’s set is simply three grey walls that make a huge grey box of the stage. Robert Carsen’s innovation is the use of a hundred chorus members and supernumeraries to represent the common people of France who support the Revolution. In the first scene set in Blanche’s home with her father and brother, Carsen has the masses of people in designer Falk Bauer’s drab working clothes surround the three aristocrats in their colourful 18th-century silk finery while they discuss the increase of violence against the nobility. When Blanche enters the monastery, the walls keep out the masses for a time, but when the police arrive to take over the monastery, the side walls rise and the masses stream across the stage revealing simply through their numbers the impossibility of opposing their will. Carsen draws exquisite performances from the entire cast. Bayrakdarian is an ideal Blanche, her clear, ringing soprano able to communicate both fragility and strength. 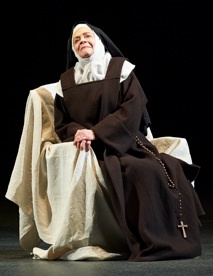 Judith Forst gives a shattering performance as the dying Mother Superior. There no disguising that this is the voice of a 69-year-old, but that is exactly what is required and Forst still has surprising strength in her highest and lowest notes. Adrianne Pieczonka is in glorious form as Madame Lidoine. Her voice and acting radiate warmth, comfort and strength as the new prioress, which is just what the nuns need after the horrifying experience of the Mother Superior’s death. As she inspires her charges she inspires us to see that their deaths can serve to glorify God. Irina Mishura, the sole non-Canadian in the cast, is outstanding as Mère Marie. She uses her rich mezzo-soprano to capture the ambiguous nature of this woman, who wants to hush up the ignoble manner of the Mother Superior’s death and later is too eager to require a vow of martyrdom from the nuns. Hélène Guilmette is a delight as Soeur Constance, her bright agile soprano the perfect medium for a young woman who finds joy in everyday life. This is primarily an opera about women, but the few men’s roles are also well taken. Jean-François Lapointe sings with great authority as Blanche’s father, the Marquis de la Force. Frédéric Antoun has a beautiful tenor, but his voice did not always penetrate the wall of orchestral sound except for his highest notes. Michael Colvin provides a fine characterization of the Chaplain for the nuns, under siege by the Revolutionary forces for still practicing his religion. Conductor Johannes Debus firmly relates Poulenc’s score back to the music of French Impressionists like Debussy and relishes the tang of Poulenc’s sonorities and the vibrancy of his constantly changing rhythms. Anyone who knows Poulenc’s familiar Gloria (1961), will see how closely related the opera is to Poulenc’s sacred pieces of the time. Debus did not always maintain an ideal balance between the orchestra and the stage, so that Antoun was not the only singer whose voice was covered on occasion. In no doubt, however, was how Debus welded Poulenc’s sometimes shortish phrases together with a knowledge of a scene’s overarching structure. Instead of the gruesome finale where the nuns mount a scaffold one by one, their singing slashed repeatedly by the harsh fall of the guillotine, Carsen has substituted a more symbolic depiction of the nuns’ deaths choreographed by Philippe Giraudeau. The intention is to show their deaths not from the point of view of the surrounding crowd but from the point of view of the nuns themselves who are able to see faith transform something horrible into something beautiful. It is emotionally shattering but strangely uplifting as well. In the poem “Easter 1916”, W.B. Yeats wrote of the execution of the leaders of the Easter Rising in Ireland by the British, “A terrible beauty is born”. And so it is here. While opera made have had its roots in an actual historical event, the work has only gained in relevance over time. Now the martyrdom of sixteen women enforced by a government of men has acquired resonances beyond a specific time and place. Carsen’s abstract staging only serves to bring these resonances to the fore to make an already powerful work an overwhelming experience. Photo: (top) A scene from Dialogues des Carmélites; (middle) Judith Forst as Madame de Croissy. ©2013 Michael Cooper.